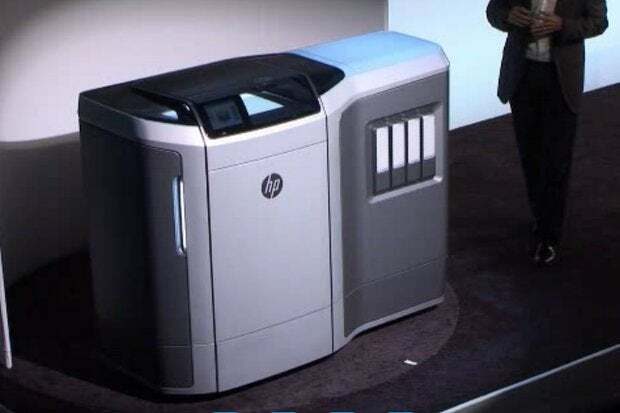 HP's announcement this week that it's entering the 3D printing market with an industrial machine that is 10 times faster and 50% cheaper than current systems, immediately brought out the online snark. "The question is, will it print a prototype that's just in black if you're out of Yellow polymer?" Reddit user ILikeLenexa wondered. "3D printing from the company that charges the moon and stars for ink refills? Full vendor lock in? I don't think so..." wrote another named TotalWaffle. "There's a lot of parallels between document printing and 3D printing, so our company's been looking at HP for a long time, thinking it's an excellent candidate to enter this market place," said Terry Wohlers, president of research firm Wohlers Associates. Recently, Wohlers said he was given a demonstration of HP's new Multi Jet Fusion printer and was "blown away" by the speed, quality, feature details of printed items and by the brilliant colors it produces. 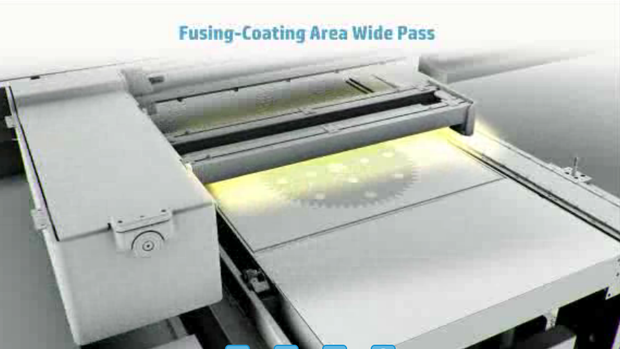 A small part created with multiple colors on the HP Multi Jet Fusion printer. "It's better than I expected. It's many times faster than anything on the market," he said. "It's something that is vastly different than what has even been developed before." Stratasys, the largest maker of 3D printers today, and a company that regularly sees 60% year over year revenue growth, said HP's entry is far from frightening. "This activity will bring more awareness, and it will lift the overall space. We see it as a big opportunity for the industry," the company said in a response to a Computerworld request for comment. 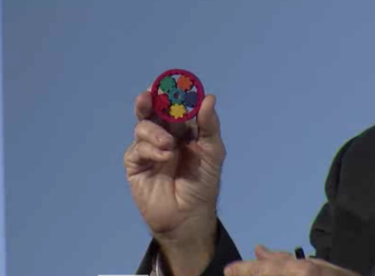 Wohlers said that while 3D printing is still in its "early days" HP's move will accelerate growth in ways never seen. A one-quarter pound chain link made with HP's Multi Jet Fusion 3D printer is prepared to lift a one-ton car. 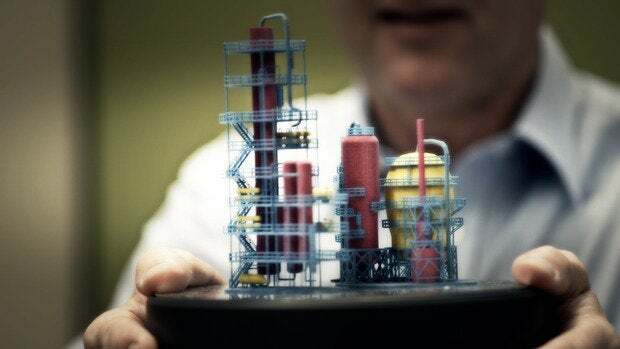 "HP's new 3D printer, if people see that and they're not blown away, then they don't understand what it takes to build parts using conventional manufacturing," Wohlers said. "It's not only a game changer, it's going to rewrite the rules in the 3D printing industry." 3D printing, which has been around since the 1980s, has mainly been used to more quickly produce prototypes -- a process known as rapid prototyping through additive manufacturing. 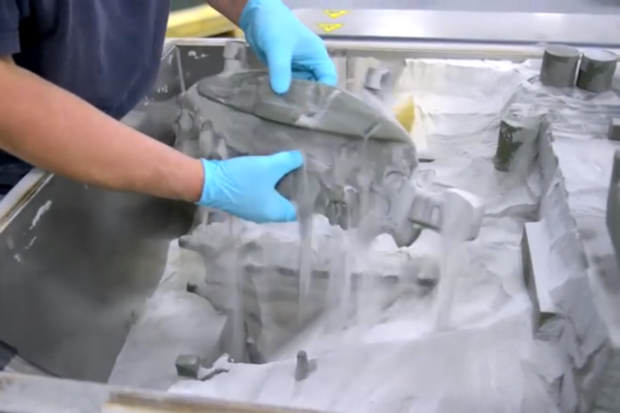 Rapid prototyping with additive manufacturing slashes development time and costs because test parts no longer need to be sent off to a design firm and then cut on a giant machine tool lathe from blocks of metal or other materials. With that method, it's one mistake and back to the drawing board. A worker at the Ford 3D Printing Lab in Detroit removes a part from the 3D Sand Printing bin. Ford has several "binder jet printing machines" that churn out large bins filled with 100 or more molds into which molten metal will later be poured to make metal prototypes. A single binder jet print run can take as little as a week or as much as a month, depending on the job size and deadline. Imagine 100 Multi Jet Fusion printers all churning out replacement parts on an as-needed basis for an aircraft or automotive manufacturer -- and say goodbye to inventory storage costs or wasted product. Say you've got a new model car or you need to modify a faulty part -- just adjust the part in CAD software and hit "print" again. If there's any doubt about that prospect, you need look no further than Ford or Airbus, two multi-billion-dollar, multinational companies that have been successfully integrating 3D printing into parts production for years. "I see this as a revolutionary technology," said Pete Basiliere, research vice president at Gartner. It's unique, not because the printer's components haven't ever existed, but because they've never been combined into a new, faster process. A view from the top of the HP Multi Jet Fusion 3D printer showing a print bar. It looks like a scanning bar on a typical 2D printer. The 3D print bar, however, has 30,000 nozzles spraying 350 million drops a second of thermoplastic or other materials. A model of an oil rig printed by the new Multi Jet 3D printer. Notice the details and colors. While the Multi Jet Fusion printer isn't due out until 2016 -- it'll be beta tested by manufacturers in 2015 -- its unveiling is sure to spur R&D in the 3D printing industry and beyond. That's because the company that invents and successfully markets a better manufacturing method wins. "As has happened all throughout history, if you invent a new process for making things, people will design new and better things," said Carl Bass, CEO of Autodesk, a maker of professional 3D design software. A model of a dinosaour skull printed with HP's new Multi Jet Fusion 3D printer.